Noboru-ojisan, I still cannot believe that you have passed away. You have always been by my side, joking and laughing; I thought I could always rely on you. When it was decided that I would be getting married and coming to America, my mother was very worried about letting her daughter go to such a faraway place. You gave her strength by saying with a nudge, “It’s alright, let her come.” Since then, you have always been my emotional support. Whether it be happy or sad moments, you have always treated me with warmth. Even though my parents were far away, I never felt lonely since I was able to receive an abundance of strength and love from you, along with the Taguma cousins. For the almost 31 years since I arrived in America, you have rarely missed our monthly service at our church. You drove every month from Sacramento to San Francisco, then to Hayward bringing your whole family. Each time you came, even if you had a brand new car, you would fill up your entire trunk with fruits and vegetables. It was so heavy that the front of the car would rise up because of the weight. You would bring more than enough so that we could share it with people in the San Francisco area. Sakae-obachan would often tell me how you enjoyed talking to and being thanked by many San Franciscans when they saw you at the Mission Headquarters in LA. 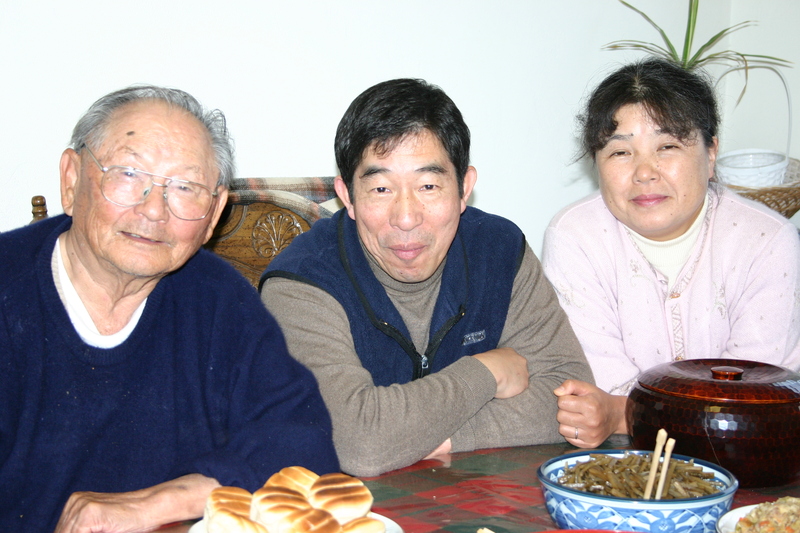 When my oldest son was still a small child and didn’t have any siblings, I remember the Taguma family would visit and play with him. And when it was time for you all to go home, he would cry and say that he wanted to go home with you all, regardless of the fact that I was holding him in my arms. It made me feel very warm and appreciative knowing that although his real grandparents lived far away; he still had his Ojichan and Obachan and the whole Taguma family nearby who truly loved him. This is something I will never forget. After your stroke stopped you from driving, we took the liberty of picking you up for monthly service. You would always say, “We don’t need to go anymore, we don’t need to go anymore,” saying that it should be left for the young people to do. However, when the day came to leave for church, Obachan would say that you would be ready one to two hours before the set time and wander in and out of the house waiting to be picked up. Hearing this story made me very thankful and warmed my heart. Even last month’s service which ended up being your last, you were the same as usual being at the core of laughter. When it was around the time for you to leave, you again said, “We don’t need to go anymore. It must be hard for Shiori to pick up and send us home.” But I told you that I can’t hear anything that you are saying and that Shiori will just go and put you in the car so you have to come. Everyone laughed and agreed, and that was the end of it. We all said our goodbyes and that we would see each other next month. I never imagined that day would be the last time I would see you. Throughout all these years, I have never seen you in an unpleasant mood, which allowed me to rely on you without worry. It touched my heart deeply. It has become very lonely without you, but I am encouraged knowing that I still have Sakae-obachan, who you have been one in body and soul with all these years. I hope to respect and care for her to uphold “oyakoukou (filial piety),” which is something that you always talked about. Ojichan, thank you very very much for helping me all these years and also keeping the promise you made to my mother. I hope to meet you again even after rebirth and be able to properly thank you. I truly thank you very much.